I had been in serious need of a new setting spray as I haven't had one for a couple of months and I had really started to notice my makeup just wasn't lasting well, oily skin problems. I had been using the Urban Decay one for about a year but I thought it was time for a change and after hearing great things about this one I knew I had to get my hands on it. 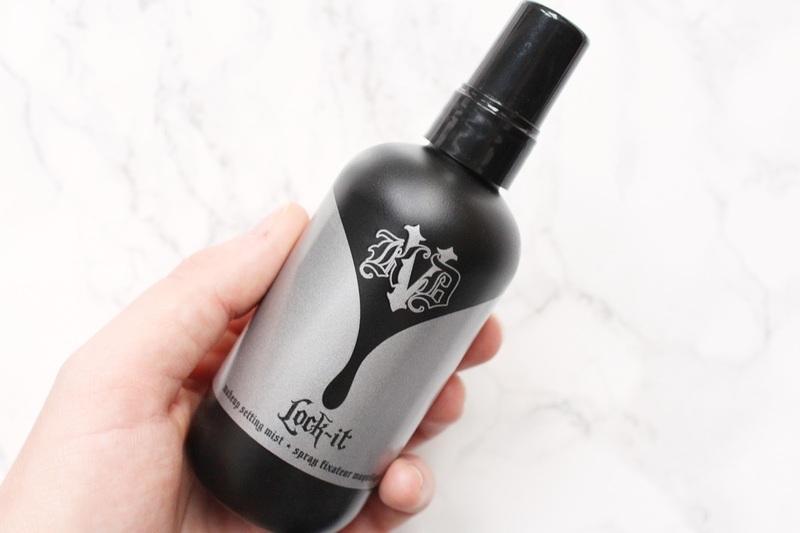 The Kat Von D 'Lock It' Makeup Setting Spray retails for £20 at Debenhams for 120ml. The main reason I had been wanting this is because of Tati (GlamLifeGuru on YouTube) as I always buy things on her recommendations and I am never usually disappointed. I had mentioned in my post the other day that I wanted to try more Kat Von D products and this is one of the ones at the top of my wishlist. This year I am only buying cosmetics that aren't tested on animals so you can never go wrong with Kat Von D beauty products. This is 100% cruelty-free and it's also vegan too. This setting spray claims to be the finest setting spray on earth and the powerful formula is dispensed through an innovative Soft Mist System. This is a non-aerosol dispenser to deliver a luxurious, continuous spray that you can get from an aerosol but in a more environmentally friendly format. I really do love the spray of this product, it is incredibly fine and you can barely feel it as you apply it. I'm not used to my face not feeling slightly soaked after using a setting spray so it did take some getting used to, at first I swear I was spraying 15 pumps just to make sure I had applied it! I have actually become obsessed with the spray as it doesn't interfere with my makeup in the slightest but it has such long-lasting benefits! The product itself comes in a great sized bottle, I'm not crazy about the packaging but it does fit the Lock It line perfectly. The product itself once spritzed on the skin has a very light refreshing cucumber scent, it's not at all irritating and I like that it has a scent as every other setting spray I have tried hasn't had a nice scent. The main reason I wanted to try this so badly is that it claims to keep your makeup fresh and vibrant for a full 24 hours which is eight hours longer than the leading setting spray. I have been really putting this claim to the test and trying it out with almost all of my foundations to see just how well it works and it really is incredible stuff and is one of the best setting sprays I have used! This makes my makeup last so much longer than it would with any other setting spray, I can apply my makeup at 6am and it still looks great at 10pm! One of my favourite foundations if the Too Faced Born This Way and it just never usually lasts on my skin for more than six hours before it looks terrible but this setting spray completely transforms it! It makes the Too Faced foundation last all day long and I never need to do more than one touch up throughout the day and that's normally only needed due to the fact that I touch my face a lot so some areas of foundation do rub off slightly. I don't ever wear my makeup for a full 24 hours but it really does make my makeup last from the moment I applied to until the second I remove it, I'm hooked. 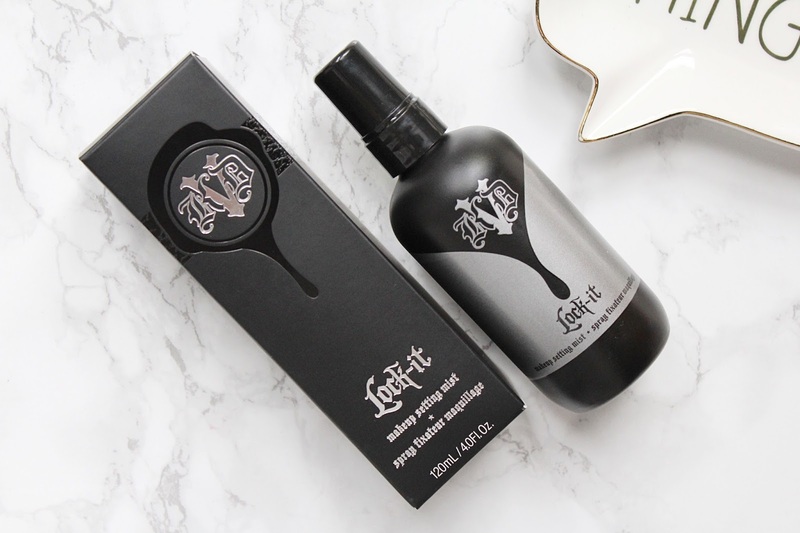 The Kat Von D 'Lock It' Makeup Setting Spray retails for £20 at Debenhams - HERE.